Spy-Smasher appeared in 1940, as a minor character published by Fawcett Comics. 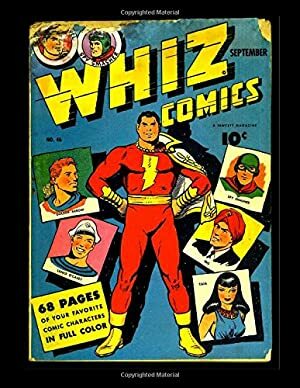 Fawcett was huge during the 1940s, as their Captain Marvel was very popular. 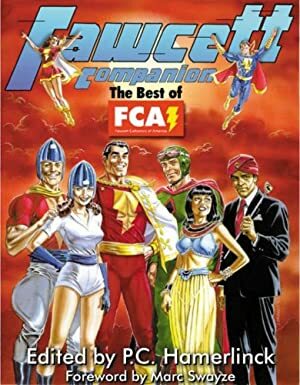 Fawcett characters were eventually bought by DC Comics – see our Ages of DC Comics article for more about that. Like many 1940s characters, Spy-Smasher was formulaic and faded away after the demobilisation. But he still occasionally features in flashback sequences and the like, since he’s a good shorthand for Golden Age super-hero in what became the DC Universe. Known Relatives: Eve Corby (fiancée), Admiral Corby (her father). Group Affiliation: Pre-Crisis: Squadron of Justice II ; Post-Crisis: All-Star Squadron (inactive member). I gave him Jumping because he does an inexplicable amount of long-distance jumping (in Spy Smasher #1 at least). The art is rarely very clear. In some places, he even seems to be flying ! 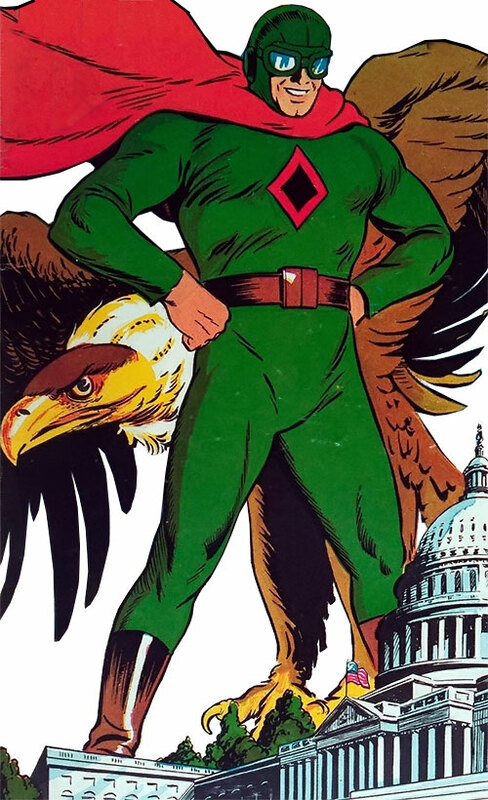 When and why Alan Armstrong donned a costume and began fighting crime as the Spy Smasher is not known. His first recorded adventure took place in the early part of 1940. Navy Admiral Corby phoned Alan to let him know that a plane flown by Eve Corby, the Admiral’s daughter and Alan’s fiancée, had been shot down. She was presumed dead. But Alan refused to believe it. Having heard that the foreign master spy known as the Mask and his gang was responsible for the plane crash, Alan suspected that Eve wasn’t dead but rather taken captive by the Mask. Later that night Alan donned his Spy Smasher costume and took to the air in his specially designed Gyrosub. He quickly located the Mask’s hideout and saved Eve. The Mask however managed to escape in the process. In the following months the Spy Smasher encountered the Mask on a number of occasions. In the spring of 1941 the Mask managed to capture and unmask the Spy Smasher. The Mask then subjected the Spy Smasher to a brainwashing device called Brainograph, intend on making the Spy Smasher the first lieutenant in his fight against the American government. The Mask ordered the Spy Smasher to work against the government and implanted him with murderous tendencies. The Brainograph worked better than even the Mask had expected so when the Spy Smasher was released from the device he had only one thought in mind: “Kill”. He then jumped the Mask and killed him. Even though the Mask was now dead, the Spy Smasher was still crazed by the Mask’s hypnotic command to destroy the American government. The Spy Smasher then began a wave of terrorist activities. He bombed an armory, destroyed a bridge sending a number of army trucks and their human cargo to certain death. He also tried bombing a secret conference of Army and Navy officials. Realizing that the Spy Smasher had turned against the government, Admiral Corby called in Bulletman to stop him. Having stopped a group of convicts at a federal penitentiary equipped with guns, rifles and ammunition by the Spy Smasher, Bulletman set after the Smasher and his Gyrosub. Using one of the Gyrosub’s missiles, the Spy Smasher knocked Bulletman out of the air. He then took the seemingly unconscious Bulletman to the Mask’s lair in order to try and get Bulletman to join in the quest. Bulletman had played unconscious in the hope that Spy Smasher would try just that. And he was able to resist the hypnotic suggestions due to his increased brain power. However before Bulletman could again submit the Spy Smasher to the Brainograph in an attempt to reverse the process the Smasher escaped. The Spy Smasher was now so crazed that he became intent on killing his fiancée, Eve Corby, because she supported the government. Bulletman managed to stop him in his quest, but then Eve biased by her love for the Smasher helped him escape. Eventually Bulletman managed to get the Smasher back to the Mask’s lair and reverse the process by once again submitting Spy Smasher to the Brainograph. Now back to his old self Spy Smasher was forgiven his acts of sabotage and he went back to fighting crime. 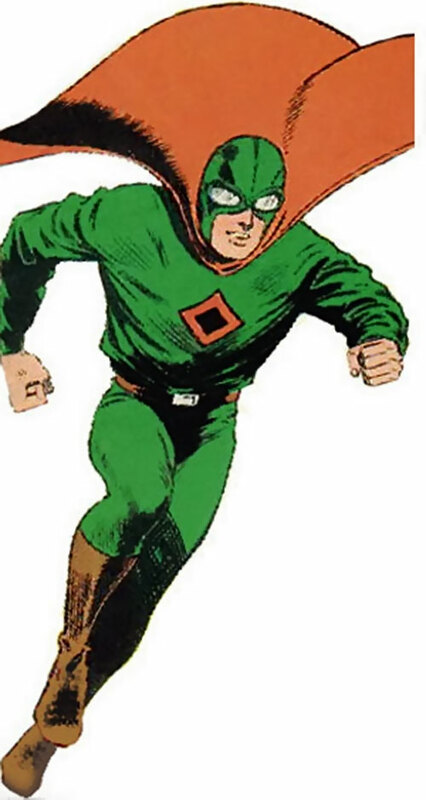 In the following months the Spy Smasher went up against a number of new villains such as the Dark Angel [no relation to Byrne’s stupid WW villain], the Golden Wasp (no relation), and the America-Smasher. In the summer of 1943 he teamed up with Captain Midnight in order to get back Captain Midnight’s newly invented “cyclone engine” airplane. After the war Alan put away his Spy Smasher costume and became a private investigator, calling himself the Crime-Smasher. By the height of the Cold War he had once again donned the costume and identity of the Spy Smasher. As such, he helped out C.C. Batson getting the Scorpion, a old Egyptian artifact, out of East Germany. On their way out they ran into Baron Blitzkrieg who was also after the Scorpion. Although Spy Smasher was nowhere near Blitzkrieg’s league he eventually bested the Baron. The two heroes managed to escape with the Scorpion in their possession. Alan Armstrong has long since retired and is now living a quiet life in Fawcett City. He may have a descendent who became a new Spy-Smasher. He wears a green (or brown) costume consisting of aviator’s hood and goggles, shirt, and pants. He has a red diamond for a chest symbol and wears a red cape. A strange fellow, usually deadly serious but occasionally making small quips in a fight, usually strong-willed but occasionally nervous. He is in many ways a typical bland Golden Age hero, though he is willing to kill his enemies, but not in cold blood. Spy Smasher lands in Germany, allows himself to be found by some Nazis who are easily convinced that he wants to join their side, and makes friends with Goering, who refuses to hear anything negative about Spy Smasher, now that he’s on their side, even though Spy Smasher sneaks out occasionally for a little sabotage. It’s like an episode of Hogan’s Heroes. Finally, he gets his chance ; as he wanders out in the woods, he sees a building where Hitler appears in one of the windows.Spy Smasher shoots Hitler and kills him. Then, Spy Smasher is caught by the Nazis, but what does he care ? He’s killed Hitler ! He then learns that the person he killed was merely a Hitler look-a-like. The Nazis now plan to pretend to the public that Spy Smasher *did* kill Hitler ; this will make Hitler into a martyr and make the Nazis fight like wild animals. Spy Smasher escapes, and has an opportunity to kill the real Hitler, but doesn’t, because he doesn’t want to martyr Hitler. He then gets to his gyrosub and radios to the German public that the dead “Hitler” has his hair parted on the wrong side, so he must be an impostor. The End. Jumping is horizontal only, not vertical. Secret ID (Note: he does a lousy job of protecting his secret ID. Not only does his main enemy the Mask figure it out, but so does Dark Angel, who invades his home with her hired goons, none of whom are killed by the story’s end ! Also, Eve Corby knows his secret, but that’s not as bad). GYROSUB [STR 07, BODY 08, INT 01, Running: 07, Flight: 09, Sealed Systems: 15, Swimming: 07, Radio Communication: 10, Radar Sense: 13, R#2. Notes : INT represents the Gyrosub’s autopilot. The Gyrosub has round windows/portholes in odd places, including one on the bottom, so he can look down at the place he’s flying over. Additionally, the Gyrosub is apparently equipped with air-to-air missiles (see rules manual for stats) as described in the Captain Marvel (or Bulletman) fight, though I have never seen the Gyrosub use any weapons]. Cape [BODY 02, Gliding: 01. He once used his cape to parachute from a high-flying plane].